NYTimes reports on latest NYT/Quinnipiac polls showing President Obama now with a comfortable lead over Mitt Romney in the critical swing states. The polls show Obama +10 in Ohio, Obama +9 in Florida, Obama +12 in Pennsylvania. 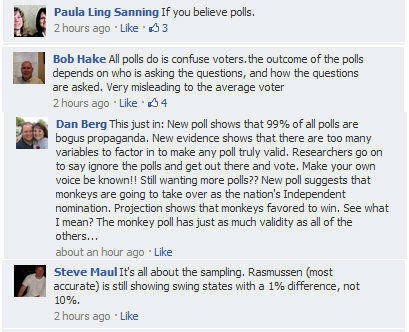 The denial is strong in these ones….especially Steve lol…. Part of this is probably attributable to what Jonathan Bernstein has called the “conservative closed information feedback loop,” in which those who get their information mainly from Fox News or Rush Limbaugh have come to believe that anything that contradicts that info simply reflects the corrupt mainstream media’s efforts to keep Americans in a state of mass liberal ignorance, by shielding them from conservative truths. And so it’s not uncommon to hear that the only polls that “really count” or are “really telling the truth” are Gallup and Rasmussen, as if all other polls done by major news organizations are mere tools of that conspiracy. But in the real world, dismissing all the polls that don’t tell you what you want to hear as flawed or corrupt is hardly the way to win elections.